Εξήντα επτά πυροβόλα όπλα κατάσχεσε η Υπηρεσία Ασφάλειας των Μεταφορών (TSA) από επιβάτες αεροπορικών εταιριών την τελευταία εβδομάδα. Στο λογαριασμό που έχει η Αμερικανική υπηρεσία, TSA στο Instangram από το 2013 και ακολουθούν περισσότεροι από 343.000 χρήστες, βλέπουμε μερικά από τα πιο τρελά πράγματα που προσπαθούν να περάσουν παρανόμως άνθρωποι μέσα σε ένα αεροπλάνο. Για την ασφάλεια των πτήσεων τυχόν αιχμηρά αντικείμενα που θα μπορούσαν να χρησιμοποιηθούν ως όπλα, δεν επιτρέπονται στην καμπίνα του αεροσκάφους. Παράλληλα απαγορεύεται η μεταφορά στην καμπίνα του αεροσκάφους οποιουδήποτε είδους όπλου. #TSAOnTheJob - Canine handlers are seen here working at the Washington Dulles International Airport (IAD). Hundreds of teams work daily around the nation to keep our transportation system safe. #TSAGoodCatch - These throwing knives and holster were discovered in a carry-on bag at the Austin–Bergstrom International Airport (AUS). While all knives are prohibited from being transported in carry-on bags, they may be packed in checked baggage. #TSAGoodCatch - This loaded firearm was discovered in a carry-on bag at the Rogue Valley International–Medford (MFR) Airport in Oregon. This is one of the 67 firearms discovered in carry-on bags last week. While firearms are prohibited in carry-on bags, you can pack them in your checked baggage, as long as you meet the packing guidelines: bit.ly/travelingwithfirearms. #TBT - This belt of ammo was discovered several years ago in a carry-on bag at the Richmond International Airport (RIC). Ammo may be transported in your checked baggage as long as it’s securely packed in fiber (such as cardboard), wood or metal boxes or other packaging specifically designed to carry small amounts of ammunition. Read more: bit.ly/travelingwithfirearms. #TSAGoodCatch – These push daggers were discovered concealed underneath the insoles of a pair of shoes last week at the Port Columbus International Airport (CMH). Knives are always prohibited from carry-on property, and concealed knives can lead to arrest and fines. #TSATravelTips - The firearm pictured here was discovered in a carry-on bag at the George Bush Intercontinental Airport (IAH). It’s one of the 48 firearms discovered last week in carry-on bags around the nation. Of those firearms, 42 were loaded, and 15 had a round chambered. While firearms are prohibited in carry-on bags, you can pack them in your checked baggage, as long as you meet the packing guidelines: bit.ly/travelingwithfirearms. #TSAGoodCatch - This inert artillery round was discovered in a checked bag last week at Washington Dulles International Airport (IAD). Three flights were delayed for more than two hours while explosives specialists determined whether the round was live or not. 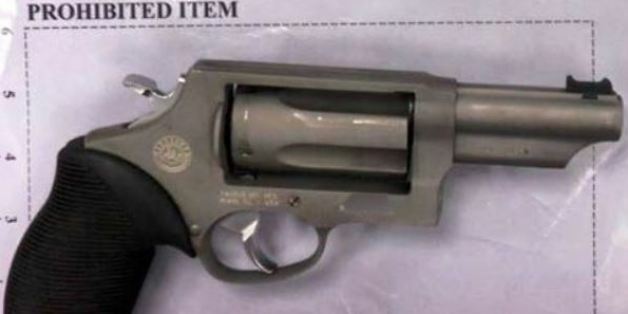 #TSAGoodCatch - This loaded firearm was discovered on Saturday in a carry-on bag at the Hartsfield–Jackson Atlanta International Airport (ATL). While firearms are prohibited in carry-on bags, you can pack them in your checked baggage, as long as you meet the packing guidelines: bit.ly/travelingwithfirearms. #TSAGoodCatch - These are just a few of the prohibited items discovered last week in carry-on bags around the nation. While knives, hatchets and throwing stars are prohibited in carry-on bags, you may pack them in checked baggage as long as they’re not illegal where you’re traveling.